Join Today! Not currently a member? Become a Member and be sure to check out our Event Calendar and weekly Director's Notes to participate in future programs. Foggy Bottom West End Village members have interests and expertise in common. To capitalize on this, the Program Committee has organized affinity groups around various interests. These groups are self-directed by members and all interested members are welcome to join the groups and their activities. Coffee & Company: Meets for conversation every Tuesday from 10:00 to 11:00 am at Bread and Chocolate, 2301 M Street NW. All Village members are invited to participate in the group on a drop-in basis, and registration is not required. Contact Us for more information. 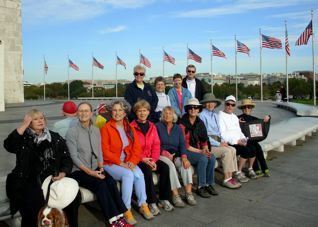 Walkie Talkies: This is a walking group that meets every Friday morning (weather permitting) for a 2-3 mile walk, or up to one hour, whichever comes first. The walk starts at 8:00 am at 24th & L Streets NW and then moves on to Watergate West at 8:15 am to pick up more participants. There is a faster walking group and a slower walking group. Contact Us for more information. Mindfulness Meditation Affinity Group: Meets in the West End Public Library small conference room, 2301 L St., NW. Doors open at 4:15 pm and close promptly at 4:30 pm. All Village members are welcome to participate, and no prior meditation experience is required. The group is held on a drop-in basis, and regular attendance is not required. Village member Jane Selby, who has practiced mindfulness meditation for many years, spearheads the group. Contact Us for more information. The Adventures in Film Discussion Affinity Group: This group meets when a film of interest is available, usually on a Thursday afternoon, at Landmark West End Cinema. Watch weekly Director's Notes for information. All members are invited to attend on a drop-in basis and registration is appreciated, but not required. Members pay for their own tickets. The films generally start at 1:00 pm. Contact Us for more information. G.O.A.L. (Guys Only at Lunch) Affinity Group meets on the third Thursday of the month. Men of all ages, retired, semi-retired, young in heart and mind are invited to join us for lunch and conversation on such topics as current events, sports, politics, economics, financial markets, movies, books, and local eateries. Contact Us for more information. The Women's Lunch Affinity Group visits area fine dining restaurants for a Dutch treat lunch with good food and great conversation. The Women's Lunch Group convenes on the fourth Wednesday of each month at 12:30 pm. All women members are invited to participate, though lunches are generally limited to 10 participants. Registration is required and fills up quickly. Contact Us for more information. Caregivers Support Group: Many of our members are already providing care for a spouse, a partner, a parent, another family member, or a friend. This support group, facilitated by a licensed clinical social worker, provides an opportunity for caregivers to share their experiences, their struggles and their support with one another. If you are interested, please Contact Us for more information. Connecting Through Knitting Affinity Group: Claire Wagner, a knitter with decades of experience, can teach anyone to knit beautiful, tactile, and colorful projects. (Seasoned knitters are also welcome to bring their current projects and share their knitting experiences.) Meets the first and third Tuesdays of the month at 4:30 pm at the West End Public Library.